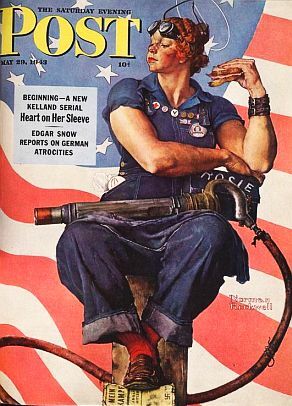 Since I have been feeling homey lately, what with the temperatures cooling and the holidays just around the corner and all, I thought it would be nice to write about Rosie the Riveter and the Home front! And as an added bonus, anyone looking for a fabulous female idol to be for Halloween should definitely follow in Rosie’s footsteps. Rosie the Riveter, icon of the 1940s, was a symbol for independent and hard working women across the nation. The widespread male enlistment into World War II created huge gaps in the workforce that needed to be filled immediately, naturally, able bodied women were the only ones left to work. By 1945, practically one out of four married women worked outside the home. Rosie’s initial role in propaganda was to bring women into the munitions industry, but her sense of strength and empowering demeanor became the most successful recruitment tool for women during the war. Women were now able to work in industries traditionally dominated by men. 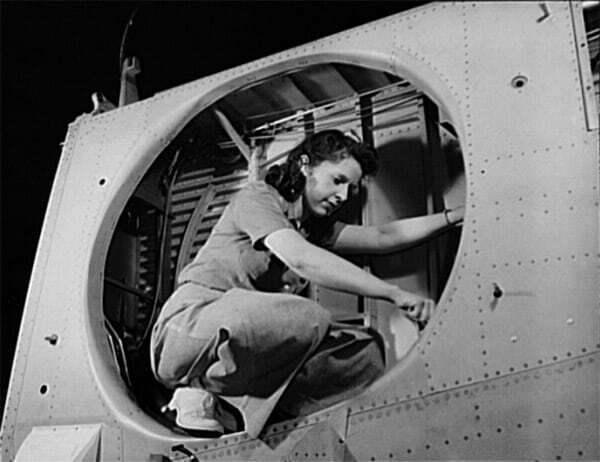 The aviation field saw the highest increase, with 310,000 women working for the U.S. aircraft industry in 1943. Munitions also saw a huge increase in female employees, most likely due to Rosie’s popularity. While Rosie the Riveter is technically a fictional representation, her inspiration came from a real munitions worker, whose loose illustration was first seen on a Westinghouse Power Company poster with the iconic slogan “We Can Do It”, originally printed in 1942. She became so popular there was even a song written about her by Redd Evans and John Jacob Loeb, solidifying her name forever. Rosie reminded women of their patriotic duty to their country. Not only did women come out in droves to work for various factories, nearly 350,000 joined the Armed Services as well. First Lady Eleanor Roosevelt, along with women’s groups, urged General George Marshall to support the introduction of the Women’s Auxiliary Army Corps, which gave women full military status. Known as WACs, the women involved worked in 200 non-combatant roles, not only at home but on the front as well. By war’s end, there were at least 100,000 WACs and 6,000 female officers. The Army Air Corps created the WASPs, Women’s Airforce Service Pilots, whose primary role was to fly across America transporting cargo and help in training missions. In all, they flew a total of more than 60 million miles. Their positions with the Air Corps allowed thousands of men to serve overseas. Out of the 1,000 women who served as WASPs only 38 lost their lives during the war. Their heroism was not recognized until 1977 when they finally received full military status. The Navy’s version of WACs was the WAVES or Women Accepted for Volunteer Emergency Service. The Coast Guard and Marine Corps eventually allowed for similar groups but the number of volunteers was not as large as the Army or Navy. Rosie’s influence was undoubtedly the result of strong female minds of American patriotism. We must not forget, not only were women working hours on end out of the home, they still had to maintain the daily needs of their families. They became the head of their households and the primary bread winners, all while their boys were fighting abroad. and red lipstick, of course.